I was inspired to write this post when my husband watched a sprint race on a TV sport program. I interested saw the sprinters who always on focus straight forward without being affected by their rivals on left or right side and even on the back. They kept focus get up to the finish line as fast as they can. I wondered what if during they ran, they always look to the back. Could they keep run fast? No. They could not. Looking back while running will slow down their running speed and can even make them fall. Eventually they failed to reach a victory. I am thinking about our life. I found some people who always failed in their life. Has much praying and prayed by many people but still failed and difficult to rise back. Their life is static in all the limitations, even in shortage. They were life in God’s way, faithful and obedient to the God’s word. Does God does not bless them? Whether the God’s promises and blessings only apply to the some people or only for the chosen people? I am very sure not like that, because God’s promise and blessing applies to all people who believe and live in Him. Then the question is what the cause is? I remembered a story of lot’s wife when the Sodom and Gomorrah destroyed by God. From this story we could know what the cause is. Actually, Lot’s wife is in God’s saving plan. It turns out she stopped walking and looked back. Then what happened? She turned into a pillar of salt. Lot’s wife still difficult to forget everything he had in the Sodom city. She still wants her old life, her property and so on. She broke the God’s message. Once again, actually Lot’s wife is in God’s saving plan but she was ambiguous between wanted to survive but on the other hand it is hard to leave all comforts of her wealth in the back. Due to continue hesitated; she could not stand to not looked back, at least for the last time. This was a very fatal choice and finally she was accepting the consequence. They kept grumbling, complaining, nagging and strong protest against the rescue of God. 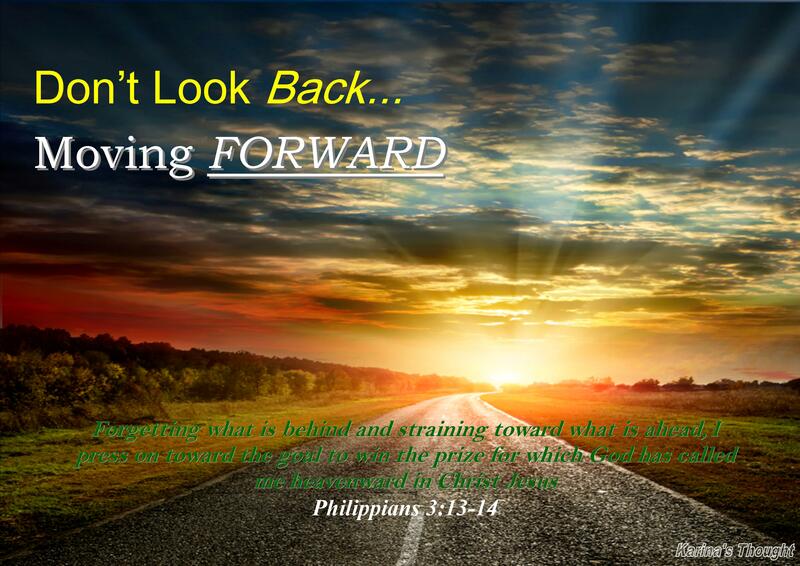 They prefer to look back rather than directing foresight toward a promised land that full of God’s abundant blessings. We know the consequence that none of the early generation which made it into the Promised Land except Joshua and Caleb who have a different heart attitude. In the New Testament, there was a story about those who wanted to follow Jesus but they chose to linger over and one of them said, “I will follow you, Lord; but first let me go back and say goodbye to my family.” (Luke 9:61 NIV) Then what is Jesus’ answer? Jesus replied, “No one who puts a hand to the plow and looks back is fit for service in the kingdom of God.”(Luke 9:62 NIV) So obvious that People who are willing to go with Christ must be absolutely ready to leave their old life. Stop looking back. Or if not, then they are not worth before God. God desires each of us to go forward. He longs to pour out His blessings, but the shadow of the past often makes us always looking back, and thereby failed to receive the God’s promises. Apostle Paul seemed to realize that humans have a tendency to always be in under the shadow of the past. So he needs to remind those who shackled in traumatic or bad things in the past. Paul gave an example, that although he had served God, he still had to focus to forget all the past, bad as anything, and focus on the goals to be achieved in the future. It’s time to let all your past go. Let’s stop looking back to the past, let’s move forward. God provides a new hope to us who live in Christ. We could learn from our past, take some positive things from there but after that, we have to let our past go far away from our mind. Do not let our past haunt our life and become an obstacle so we difficult to move forward for the better future. I will end this post with questions to ponder together. Where we stand now? Are we already on the future side and ready to open the door of bright opportunity to reach beautiful God’s promises? Or we still on the past side let its door remain open haunt our minds continually and we could not get anything there? Which one we will choose? The choice is yours. Amen. I am not just a candle on a beautiful chandelier, not just a beautiful fragrant white flowers, nor a beautiful words of wisdom. But I am definitely a daughter of our Father in Heaven who blessed by Him amazingly. I am just an ordinary God’s child but with an extraordinary blessings from Him. Thank you to God You gave me one more year to live this life with Your blessings, grace, compassion, and wisdom. Thank you for Your unconditional love. On my Birthday today, I Got a special gift from my beloved sister in Christ Sella Irene. She wrote a beautiful poem as my birthday gift. Big thanks to sister Sella. May God bless you abundantly and always used by God to spread fragrance of God’s word through your awesome blog. To all my dear reader, please allow me again to encourage you to visit, follow and read her beautiful posts. Many blessings to all of you. I love you all. that radiate a light on a grand silver chandelier. where your light is so meaningful there. Willing to melt just for the sake of accompany a fatherless and motherless children who are learning to reach their future. You are not just an epitome of gracefulness and elegance. that grows in the garden of the each human heart who need love. Spreading fragrance down to the hidden corner and brings tranquility in her tenderness. Your are not just the words of wisdom that engraved on the gold placard. Hello my dear readers, I am so happy and grateful to God could come back again in this New Year. Happy New Year! We are wishing you a year of health, wealth, happiness, success, warmth, and loads of love of your dear ones. I hope this New Year showers you with full of Joy and blessings. This is my first post in this brand new year. My beloved readers, for me personally, this verse is very encouraging and able to give peace. Actually true tranquility comes from God, not from the world circumstances where we are, instead from an abundance of money, status, employment levels and so on, nor from others. The condition may be uncertain or unclear and this time, It may be that there are among of us who in the lowest point of crisis. But by realize that the presence of God will always be with us should be able to keep us calm. Our salvation is in His hands, help on any difficult thing was upon him, guarantee of future day will be provided by God. If we continue on the next verse, an affirmation will feel getting stronger. The world may be full of uncertainties like our director said. Maybe many people predict that this year is not better than the previous year but we have rock and unshakable fortress that could be a place to hold. We can remain calm focus to provide or perform the best if we realize that God is always close to us. I was remembering story of Micah. Micah is a prophet from the remote village whose ministry is in the range of the reign of Jotham, Ahaz and Hezekiah. Situation and condition the world today seems similar as in the time of Micah. Chapter 7 the book of Micah describe the moral depravity and a very difficult situation at the time. Famine, Crop failure (Verse 1), moral degradation, loss of godly and honest people, trepan each other, deceived each other, even destroy each other (Verse 2) Has been so accustomed to do evil, corrupt officials and judges and accepting bribes, the leader imposes his will, the law perverted (Verse 3) Even the best people in the world likened as useless and stabs thorn hedge, nothing else can be trusted, broken homes, hostility among family members (Verse 4-6) Micah said that all this as a incurable and infectious wound. Is not what we are facing today is roughly equal to the situation that Micah faced at that time? But let’s take a look what Micah did at the time? All of that would be more than enough to strengthen us through the difficult days and can make us live with joy that is not from the world but from God. My dear beloved friends, what about us now? Are there any of us who are afraid to face uncertainty in entering this New Year? Whether in undergoing this New Year we are full of fear and doubt? If there are, let’s come closer to God, and get the serenity and strength. Do not let doubt fulfill our mind. Point our thoughts and views focus on God alone. Truly trust in Him! Express our fear and doubt we have in Him. God has promised something that should be comforting and calming us, something that should not make us has to lose the joy. Therefore we do not need to fear to enter the New Year which is predicted by human logic to be a full with uncertainty or hopeless. God has given so many promises as written in the verses above, so why should we be afraid? Let’s enter the New Year with joy, let’s fill this year with the best thing we can do, and let us give praise and thanksgiving to God who has promised to be with us from the beginning to the end of the year. 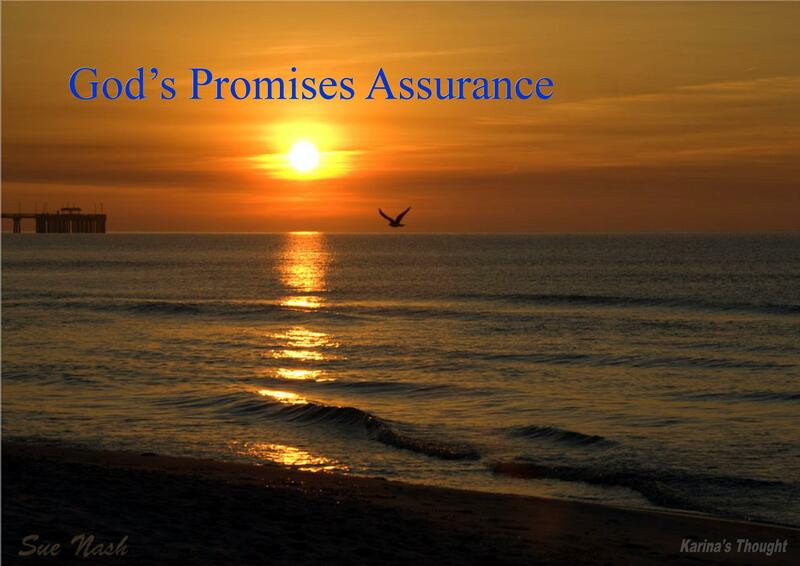 God’s promises are yes and Amen! His promises are never failed.